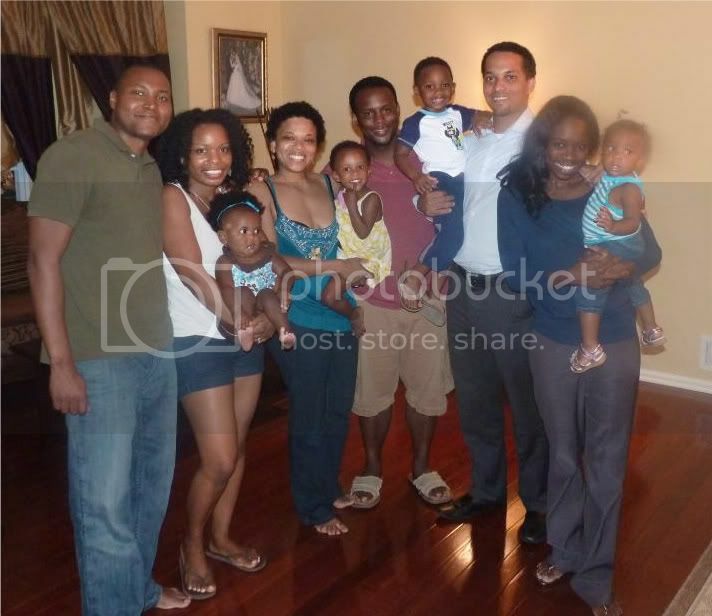 We left last Friday for a weekend visit to granny Marge's in Raleigh, NC. Then we hopped a plane to NYC on Monday. Marlie is quickly becoming a seasoned traveler. She traveled by plane, train, bus, and automobile on this trip. We should have taken her on a ferry ride so she could have experienced a boat ride too! When you travel with a toddler every parent wants to know the secrets for keeping a child calm and well-behaved. 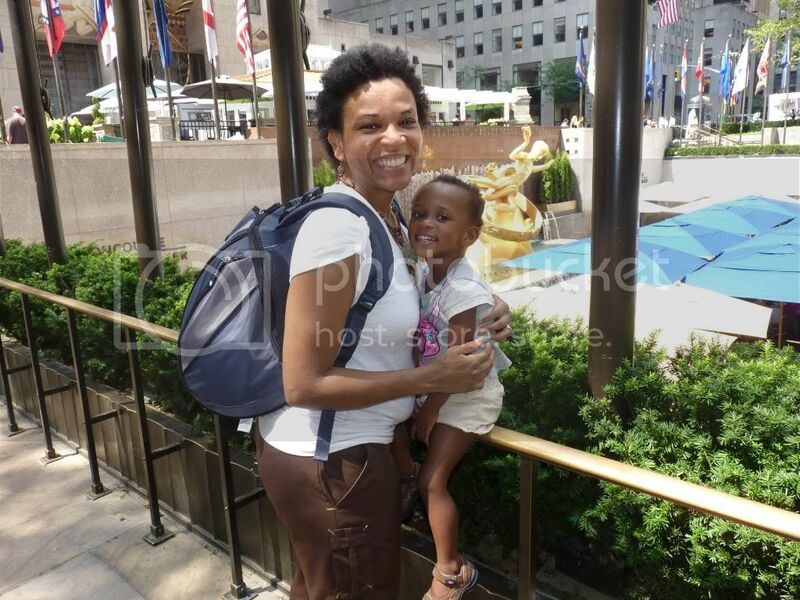 I read plenty of mommy blogs before our trip and tried to apply their advice for toddler travel. I forgot that my child tends to defy conventional wisdom. She is not one for sitting still for long stretches, period. She likes to run around. She is an energizer bunny. So, I don't really have anything that works to share with you except the lessons learned from our mistakes. Lesson 1: Make sure your high-energy child is well-rested. We caught a red-eye flight to RDU thinking she'd sleep the entire flight. Instead, she hollered and bucked like an angry bronco. She finally passed out halfway through the 2 hour+ flight, but not before giving us and the passengers around us a serious migraine. Lesson 2: Never get your child hopped up on sugar before a flight. We're chilling in the airline lounge before catching our plane to NYC. I can't resist the free chocolate chip cookies. I let Marlie have, not one, but two cookies (all of my usual restrictions go out the window on vacation). Needless to say, she was bouncing off the walls by the time we boarded. Luckily she crashed and slept the whole way there, so maybe this wasn't such a mistake. Lesson 3: Invest in a portable DVD player or iPad. I packed books and toys, but she went through those in less than 20 minutes. With 2 hours left to go, boredom can quickly turn into a tantrum. I say let your toddler watch 2 hours of Yo Gabba Gabba and save your sanity. We walked across the Queensboro Bridge. On the last visit we walked across the Brooklyn Bridge. That leaves eight more landmark bridges to cross off my list. We stayed in a rented apartment in Midtown East not far from Central Park so we went to the park a lot. I wish I could live at Central Park! We even saw the peacock that escaped from the Zoo on Tuesday and perched on the ledge of a 5th avenue apartment building. You should have seen the media vans parked on the street filming the poor bird. It just wanted to check out the fancy digs on 5th avenue and went back home unharmed. I was kicking myself for not bringing my camera on that walk. 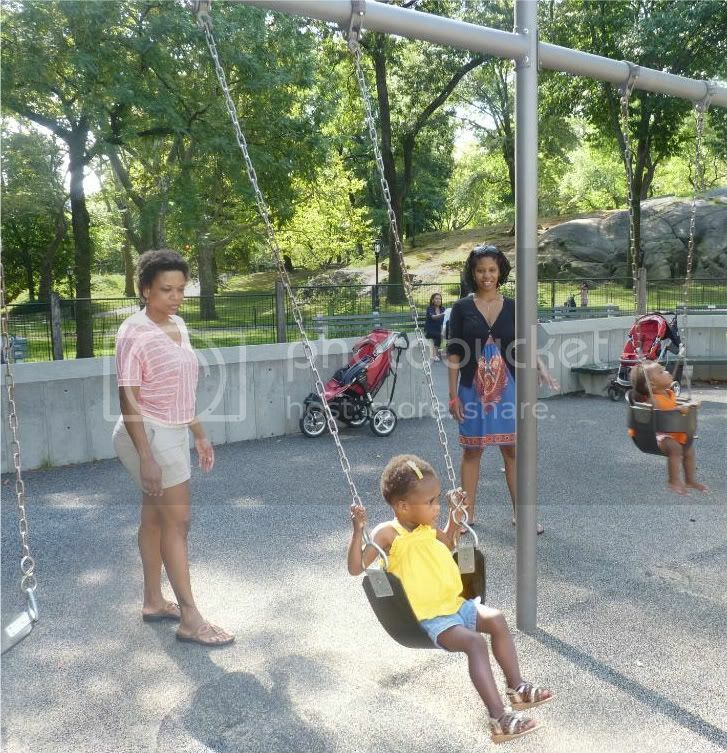 On Thursday, we met up with Quiana and baby Nia from Harlem Lovebirds for a play date at Hecksher Playground. Those two are so beautiful and sweet. They played in the water and on the slides an swings. Fun, fun, fun! 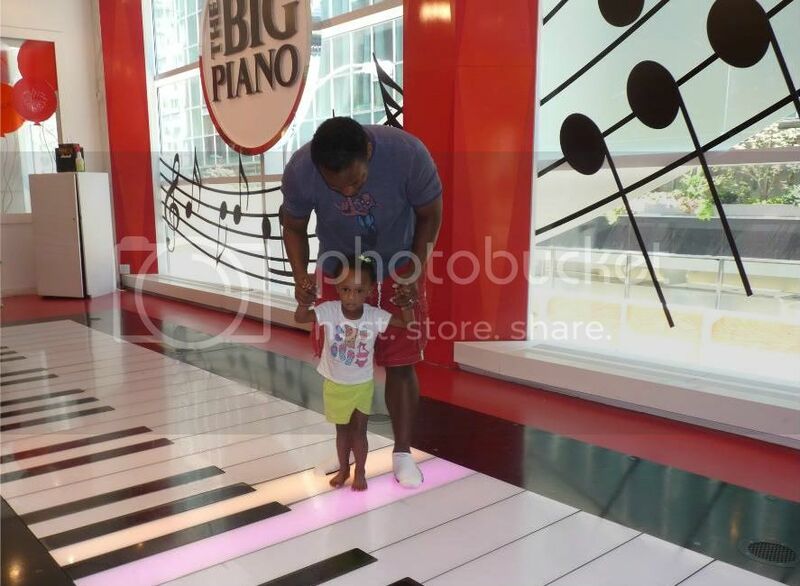 We took in some tourist sites like Rockefeller Plaza, Time Square and FAO Schwartz where Marlie got to tap dance on the piano from the movie Big. 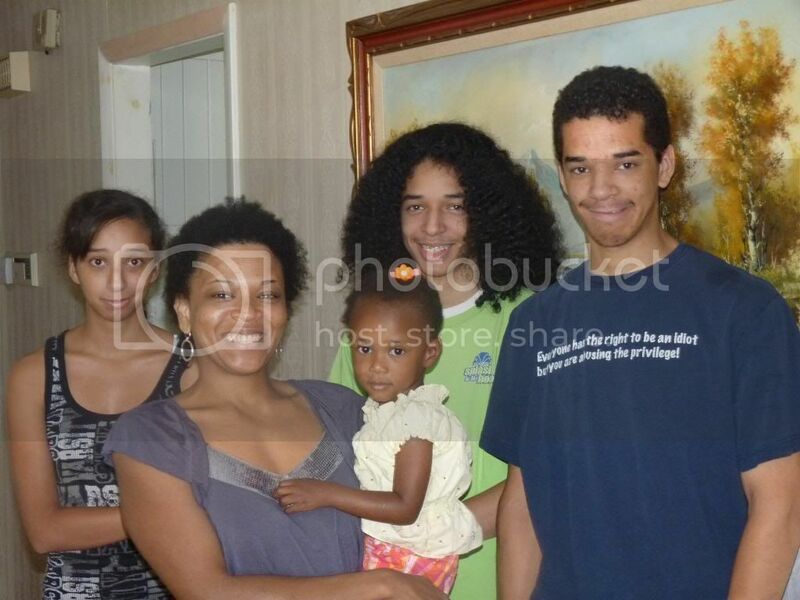 On Wednesday with drove with my godmother to CT to spend the day with my granny, my aunt/uncle, and cousins. 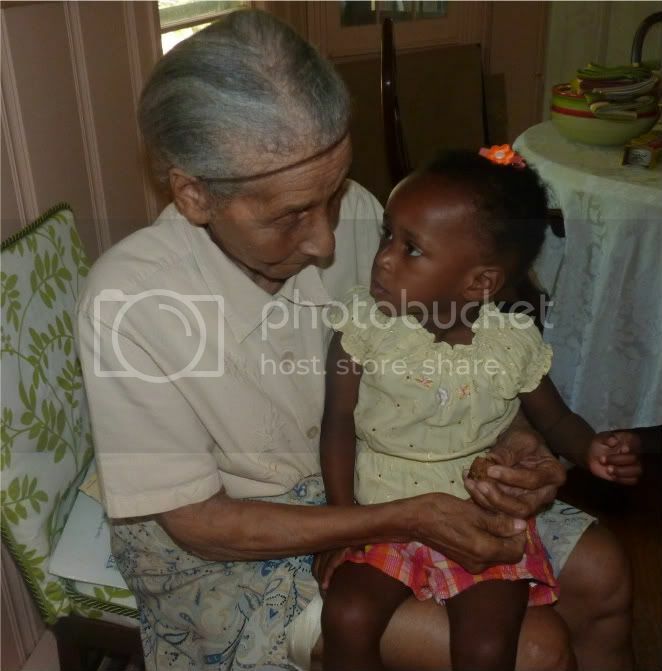 I haven't seen my grandma in three years and this was her first time meeting Marlie (her 13th great-grandchild), so it was a really special occasion. Grandma made brown stew chicken, rice & peas and baked a bun for us. We just hung out and enjoyed each others company. It was a sweet, but too-short visit. My uncle made sure to take photos of this "once in a lifetime" moment. We ate New York pizza everyday! Of course. Damon loves the taste of NYC tap water, btw. On Thursday we took the NJ Transit train to Jersey City to see some friends we have know since college. We all have children now around the same age, so we spent the evening catching up and watching the kids play. We had planned to go see one of the morning show concerts on Friday morning, but we were exhausted. Instead, we just chilled and packed. We took the NJ Transit train to Newark airport. With time to kill we decided to go hang out in the admiral's club (one of Damon's corporate perks). We walk in and I notice a man who looks like John Legend. Damon is like, "wanna go take a picture with John Legend?" I said, no. I don't get to see celebrities out in public often, but I don't think it's appropriate to bother them for pictures or autographs. Damon did have Marlie waves bye to him when we left to catch our flight. That was our trip! Now we're back home and de-vacationing. I have a lot of blog reading to do and posts to write! Oh, plane traveling was nutty, wasn't it?? That's how I felt back in June when I took EJ with me to Florida. I would have taken the DVD player, but she doesn't really watch cartoons yet. I'm hoping within the next 4-6 months, she'll try? That would make road trips we want to take a lot easier. Looks like you guys had a lot of fun on vacation. I feel your pain with having a high-energy kid. Li'l T can NOT keep still. Even when he's standing in one spot he rocks back and forth. It's been difficult traveling with him but you are right about making sure he's rested. That can make or break a trip. Oh my goodness! Marlie has certainly surpassed Miss C in frequent flier miles! Sounds like a wonderful whirlwind of a trip! I can't wait to take C to New York one of these days. What a beautiful place to share with a child. Also on the whole traveling tips - we checked our car seat (free of charge) and carried on our stroller. This worked out amazing for us and didn't cost a single penny more. We always had the stroller waiting when we deboarded and the car seat when we got out of the airport. I love New York! I haven't been back there for years, I went 3 times in college and loved it. Oh man, the pizza!!! We ate pizza every day too. Oh Teresha, I have no advice about toddler/baby travel either. Naveen cries the entire time we drive. I even gave him tylenol because I thought surely he must be in pain crying this much. It did nothing to soothe him.Deaglan used to be the same. But now that he's almost four he loves watching DVD's - the baby could care less, or he falls asleep. I thought I would never think that Deaglan was the more well behaved child. But on trips. He is. I don't get the comment about NYC tap water??? What fun! I love your lessons! I know a lot of people advocate leaving on flights at night so the child will sleep, but like you, this has never worked with my kids. I now try to leave right after they wake in the morning, which tends to be when they are best behaved. Sounds like a great time! Marlie is as cute as ever!